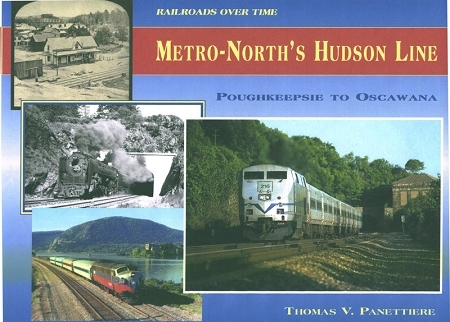 The Collinwood Shop offers a fine 'new' publisher's exhaustive coverage of the Hudson Division from Poughkeepsie to Oscawana. Text coverage begins with the Hudson River Railroad before Vanderbilt was an owner, moves through the Commodore's years into NYC stewardship, and on into the 'modern' times of Penn Central, Conrail and finally the Metro-North Commuter Railroad. Depot Square Publishing’s “RAILROADS OVER TIME” series takes a full circle approach in describing a particular line. Vintage photographs through contemporary color serve to illustrate the evolution of a selected railroad from the golden age of steam to the modern age of streamlined diesels and electrics. 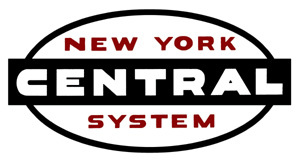 This book traces a section of the NYC’s Hudson Division from it’s initial building through the NYC, Penn Central, Conrail and Metro North eras. The subject line segment runs between Poughkeepsie and Oscawana, which includes some of the most spectacular scenery in the Hudson River Valley. While the NYC photos are about 80% b&w, the text covers the line’s history quite thoroughly. Illustrations begin with the Hudson River Rail Road and continue through the New York Central, Penn Central, Conrail and Metro-North. Early steam, E-units, FL-9s, F-10s, Geeps, B23-7s, U-boats, RDCs, SPV-2000s and Genesis engines are all shown. 160 pages, 270 color and b&w illustrations and other ephemera, bibliography, index. Printed on 80# gloss enamel paper in an Ota-bind softcover format. Translation: an absolutely phenomenal USA print job in a horizontal format. Complete bibliography and index. NYC photos comprise about 30% of the photos. Check out the pricing -- such a deal!! Non-members can walk away with this for $39.95 plus shipping! NYCSHS members get 20% off list, plus shipping. Ohio residents must add 8% sales tax, but at this price, who cares?